A candidate should possess Graduation in any discipline. The annual income of the parent / guardian / family should not be more than Rs.3.00 lakhs for SCs and STs and Rs.2.00 lakhs for BCs / Minorities. A candidate should not be employed or pursuing any other course, since this is a full time residential course. A candidate should also be eligible as per the norms prescribed by the organizations like TSPSC, Banking Services, RRB, SSC etc., with regard to qualification. The age of the candidate must not be less than 18 years and should not be more than 37 years of age as on 31.08.2019. Repeaters shall not be allowed in the 2nd batch Foundation Course and Banking Services coaching. 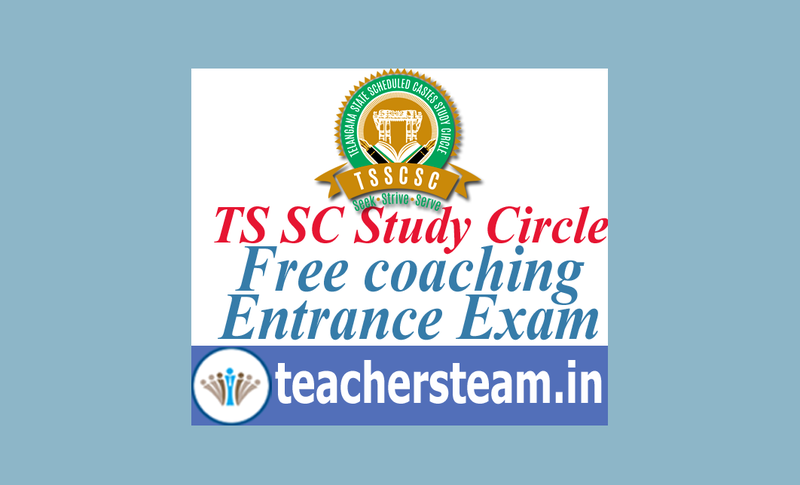 Important Dates for TS SC Study Circle Free Coaching Entrance Exams 2019. The pattern of question paper for entrance test is of objective type with 100 questions consisting of General Studies and Current affairs. The General Studies includes Polity, History, Geography, Economy, Science & Technology, Physical Sciences, Environment, Ecology and Culture, etc. The question paper for the entrance test will be in both English and Telugu versions for 100 marks with two hours duration held between 11.00 AM & 01.00 PM. There will be negative mark for the examinations. Admission is through entrance examination merit which will be held on 17.02.2019 in the (10) TSSC Study Circle District branches. Candidates can download their halltickets from 12.02.2019. The coaching programme will be organized from 27.02.2019 to 26.05.2019, in the aforesaid respective districts only. The students should be prepared to join only in the aforesaid mentioned Districts according to their choice of course. following the rule of reservation – SCs – 75%, STs – 10%, BCs – 15% (including Minorities), overall 3% Physically Challenged persons and 33 1/3rd seats allocated to Women candidates of all above said categories. Copy of latest Income Certificate for the financial year 2018-19 issued by MRO which is in force.